This is an ink, wash and charcoal map of a section of the Champlain Canal Feeder in Glens Falls. It shows the Hudson River, a feeder dam, twenty buildings including Sherman’s and VanDusen’s Mills and an unidentified road. 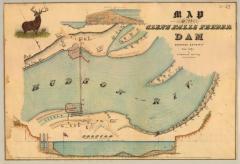 The map is artistically rendered with a illustration of a stag and dam profile. The map also shows the properties of Sherman, VanDusen and Owelling.